ONE NIGHT MY Vietnamese husband surprised me with a new dish. 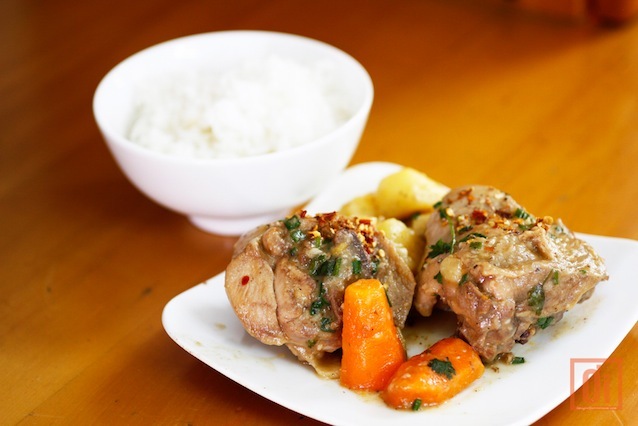 His la goo was a flavorful stew of pork, potato and carrot, served with rice. My husband, who does most of the cooking, conceded that the name of the Vietnamese staple could have been garbled a bit over time. After all, it’s been nearly 60 years since the French left Vietnam. Say “la goo” to a French-speaking person and they would immediately correct your pronunciation to “ragout”, the French word for stew, with the swallowed-up French ‘r’ sounding very similar to an ‘l’. My husband’s ragout is just one of many Vietnamese dishes that draw on French cooking techniques shared during the years that Vietnam was part of French Indochina. I am much more of an experienced eater than a knowledgeable cook, so I decided to pick the brains of people who really know Vietnamese and French cooking in my quest to identify some of the French influences on the local cuisine. First up is David Thai, winner of the first season of Iron Chef Vietnam and head chef at Le Bouchon de Saigon (40 Thai Van Lung, D1), an amazing French bistro. David, a Viet Kieu who grew up in France, says he can see the French influence throughout Vietnam, in the coffee shops and restaurants, in the way certain things are eaten as well as how various dishes are prepared. 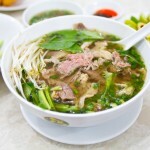 When David says pot-au-feu in his silky-smooth French accent, it does sound very much like pho. And David says he can see how the slow-cooked peasant dish pot-au-feu, literally pot-on-the-fire, could end up 13,000 kilometers away and a few decades later as pho bo. 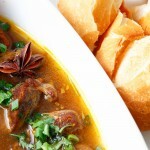 Both dishes feature oxtail and stewing beef cooked with herbs and spices in a clear broth. Add some ginger, star anise and fish sauce and you’d get a very pho-like pot-au-feu. Other famously French-influenced dishes include bo kho, which could be described as boeuf bourguignon without the red wine. Both are served with crusty baguettes, or banh mi in Vietnamese. David’s peer, Thai Tu-Tho, owner of May (3/5 Hoang Sa, D1) restaurant, says the French influence on Vietnamese cooking extends to all the claypot dishes as well. Tu-Tho, who grew up in Paris, says that before the French came to Vietnam, the local claypot dishes were quite dry. The Vietnamese cooks learned of the wonders of meat-and-gravy-type dishes and claypot cooking gradually evolved to their modern stew-like forms, she adds. On one of our food tours this week we discovered that the most unlikely Vietnamese sweet snack is also very French. 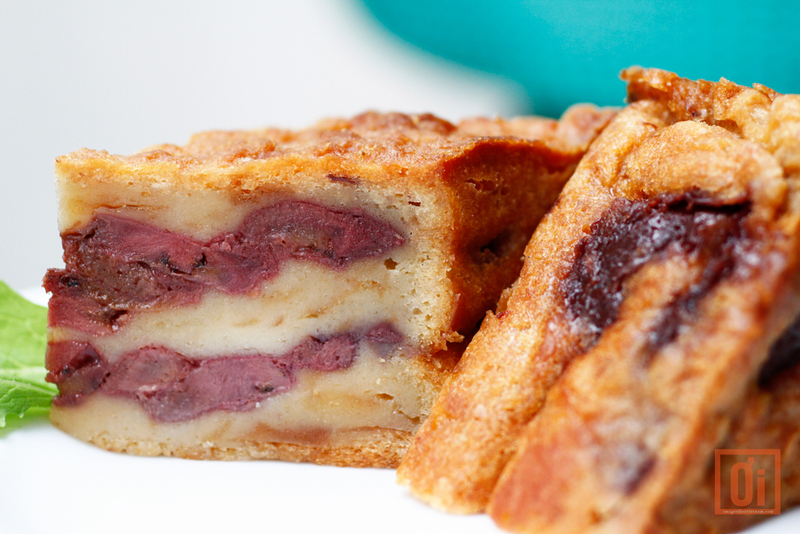 A French customer took a bite of banh chuoi (banana cake) and waved her arms around in a very French manner, exclaiming “Far Breton, zis is Far Breton!” She went on to explain that Far Breton is a dense flan from France’s Brittany region that’s studded with pinkish-purplish prunes instead of the pinkish-purplish bananas in the Vietnamese version. Our French customer said the local adaption was just as delicieux as the French original.